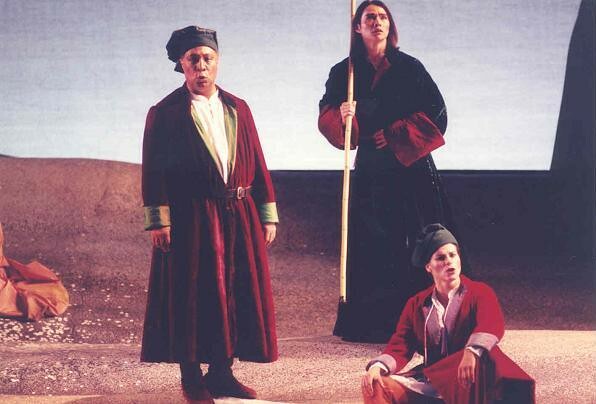 Marco Polo, an opera within an opera, marks a further stage in the composer Tan Dun’s own spiritual journey, an exploration of a new language of music and performing arts through the fusion of Western avant-garde style with Eastern accent. Multi-cultural elements such as Peking Opera, Kabuki, Indonesian shadow theatre, and the face painting of Tibetan ritual are used. It has a duration under two hours, and plays without intermission. In Marco Polo, the spiritual journey, (the cycle of the spirit and of Nature) coexists with a physical journey from West to East. 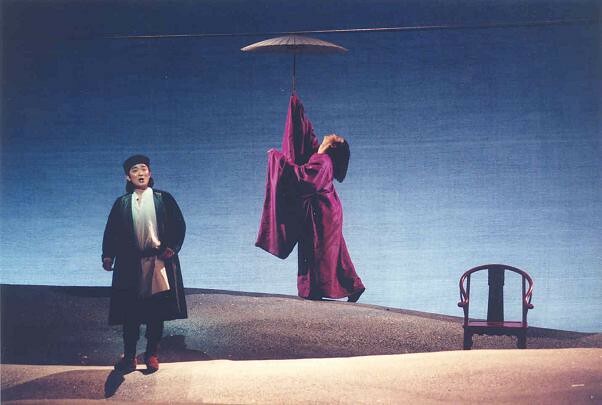 The former is explored in the Book of Timespace sections of the opera through the participation of Shadows, Memory and Nature, in Peking opera style. 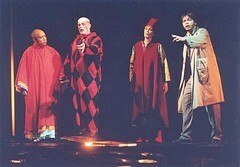 Interwoven are the legendary adventures of Marco Polo as he makes his journey from Italy to China. 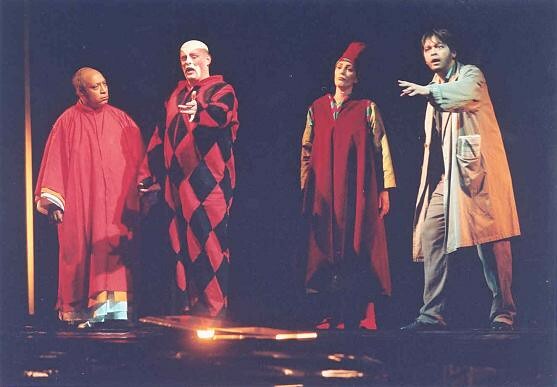 These sections are written in a more Western opera style combining avant-garde and theatrical traditions, and are played out by Beings, although with underlying echoes of the simultaneous spiritual journey provided by historical figures of Dante, Shakespeare and Li Po. Along with the geographical journey from West to East there is an important musical journey. Above the orchestra and chorus, there is a spicy ensemble of mediaeval European, Indian, Tibetan and Chinese instruments which illustrate the changing scenes of the geographic journey. The fantasy-dream world of the spiritual journey and the exciting stories of Marco Polo’s voyage are two operas that merge to the same goal, the discovery of experience from past to present to future — from the known to the unknown. Marco and Polo, led by the shadows of Dante and Sheherazada, journey from Venetian darkness across seas, desert and the high Himalayas to arrive at The Wall. 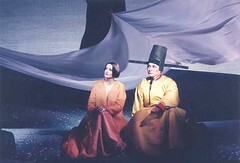 Kublai Khan awaits them: on a balcony, in the auditorium and on stage. Medieval chant, ancient timbres, violence, longing and the sensuality of nature open a world of light. In four dreams and three interviews, Marco and Polo are led by the Shadows of Shakespeare, Feud and John Cage to examine inner space. Chuang Zi dreams as a butterfly; Mahler and Li Po drink to the song of the earth. In China or elsewhere, is contact possible? Can love be achieved? Kublai still waits; Marco and Polo give way to Marco Polo; the unending begins. In writing Marco Polo, an opera within an opera, Paul Griffiths and I conceived of three journeys: Physical, Spiritual, and Musical. 1) The Physical journey is the story of Marco, the traveler, from Italy to China. 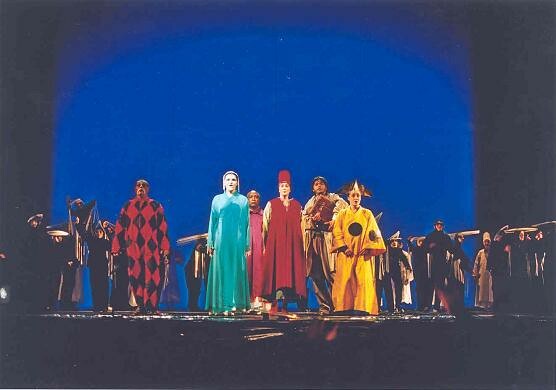 It seems that everyone’s version of Marco Polo’s travels is different, and I expect each director will respond to different elements of these tales in creating the dramatic world of the opera. 2) The Spiritual journey is a reflection on the three states of the human being — past, present, and future — and on the cycle of nature. The Wall of the physical journey is also the invisible Wall that separates these three states within each individual and prevents their synthesis into a whole being. 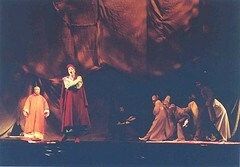 Marco and Polo begin as two characters relating, sharing the journeys, at first alternating word by word, later phrase by phrase, and finally joining in a duet. In the course of this journey they encounter, and are brought closer together by, various figures and elements of nature: Dante, Shakespeare, Sheherazada, Li Po, Mahler, and Water. Marco and Kublai Khan are the only real people; Polo is memory; the others are beyond human: Shadows and Nature. 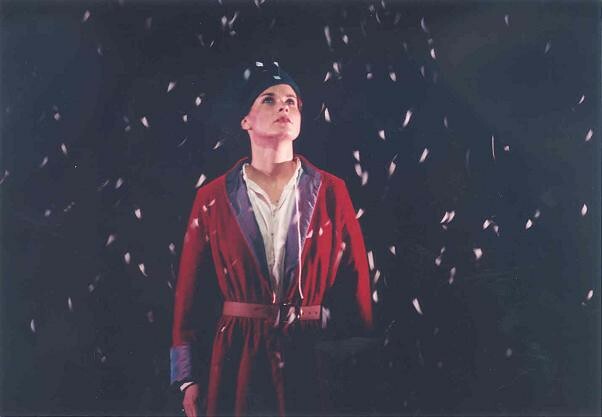 3) The Musical journey is closely related to both the physical and spiritual journeys. 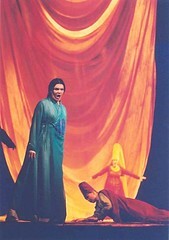 There are two operas occurring simultaneously. First (Opera I) is the Book of Timespace, which is developed on Eastern Opera vocal and instrumental traditions. 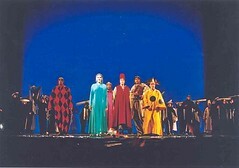 The second (Opera II) is developed on Western Opera traditions blending and layering different musical styles and colors, languages, using both Eastern and Western instruments. 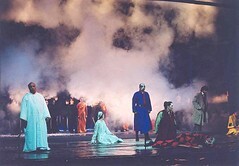 1) Marco and Kublai Khan may be the only realistically/historically costumed characters in the opera. 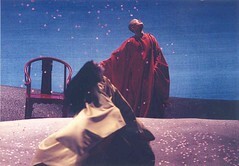 They represent the two extremes of the journey and should be costumed to highlight this Medieval/Chinese contrast. 2) Polo, Dante, and Rustichello should be costumed neutrally, that is outside the limitations of time, age, and historical context. 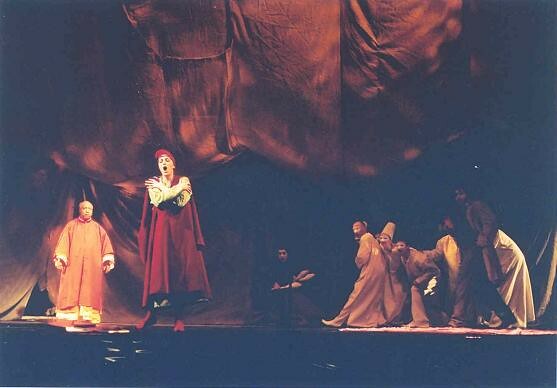 Dante should always appear in a mask that does not cover his mouth, Rustichello always with a painted face similar to a Peking Opera singer. 3) Water is of Nature, and this may be reflected in any way possible such as lights, and/or film, addition to costume and make-up. 4) Sheherazada should begin with the appearance of the story-teller she is in myth. The transition to Mahler may be made simply by adding a Western jacket. When she becomes the Queen an appropriate headpiece can be added. 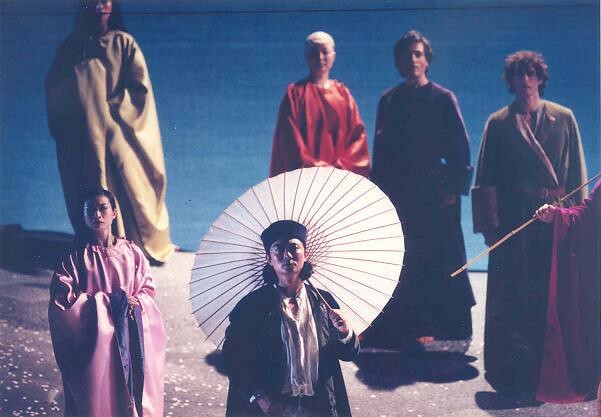 Of primary importance to me is that the production reflect the three journeys of Marco Polo, the concept of “an opera within an opera,” and that the production be simple and magical. (* Musicians may double on world and western instruments).